If the majestic pinwheel structure of this galaxy wasn't beautiful enough, the pink halo gives this photograph a magical finish. Yet, what we're actually seeing here is pretty violent. In this picture, a galactic collision is taking place between the grand spiral galaxy and the tiny dwarf galaxy that you can see to its right. 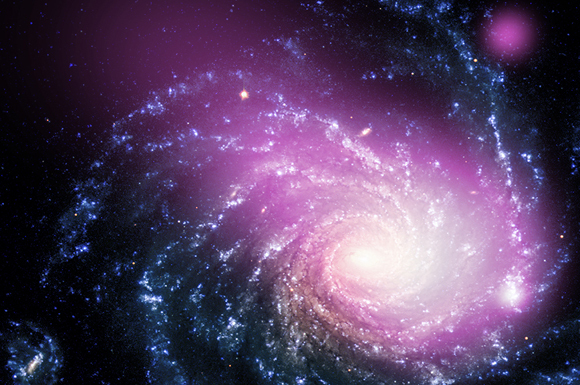 The pink mist is actually a huge cloud of gas, burning at millions of degrees Celsius, which forms when these galaxies clash! This cloud is mostly invisible to our eyes but the gas shines brightly with high-energy X-ray light at extremely high temperatures. Near the "head" of this comet-shaped fog, you can see an area with a group of very bright stars. 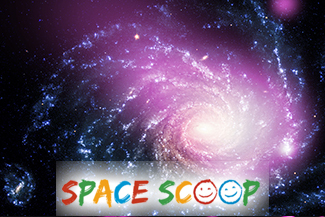 The energy of the crash may have caused a boom of star formation here. Powerful explosions from dying stars and gale-force winds coming from hot, bright stars help keep the cloud shining brightly with X-rays. Cool fact: When a crash happens on Earth, between two cars for example, it's all over in a split-second. But a collision between two galaxies happens in slow motion, dragging on for millions of years. Astronomers guess that this impact will stretch on for 50 million years!